From West Lakes: A595 to join A590 at Dalton-in-Furness bypass taking 3rd exit on roundabout. Follow A590 all the way to Barrow-in-Furness, passing Fire station and Costa Drive through on right, then Asda/Argos on left. Take a left turn onto Duke street at the traffic lights immediately after Topps Tiles & Farmfoods (on left). After 150m take a left opposite Travis Perkins onto Blake Street. The church is at the top of the rise after Brisbane Park and St James schools. 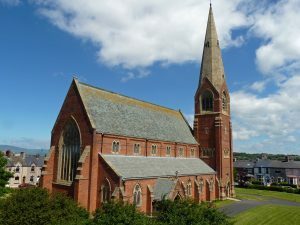 The station is a ten minute walk (half a mile) from the Church, taking right from station onto Holker Street, and left at top of rise onto Blake Street. The Station is served by the Northern Rail along Cumbrian Coast line on the west, or Lancaster/Preston or Manchester Airport to Barrow-in-Furness. Unlimited on street parking is available on 3 sides of the church (Blake Street, Hartington Street, Adelaide Street) and time limited parking between church and town. There is potential to park on the church driveway of no other event is on, and certainly recommend for anyone with mobility difficulties. Two unisex toilets (one with disabled access/facilities) between kitchen/vestry and Carey room in church annex. Normally from doors at foot of tower (if locked try doorbell on left hand side – illuminated when available/switched on). Alternative access through church main doors and along south aisle through curtained wooden partition into base of tower. Ringing chamber accessed by 42 spiral steps, but assisted by metal handrail. Handrail extends to top of tower (a further 59 steps) should anyone wish to observe the bells from the old belfry above, through the metal grid/gantry floor.